Nursery rhymes played a big role in my daughters’ early childhood. We read them, acted them out, did activities about them, and just had tons of fun with nursery rhymes. Now that they’re older, they still love them and can recite so many of them by memory. 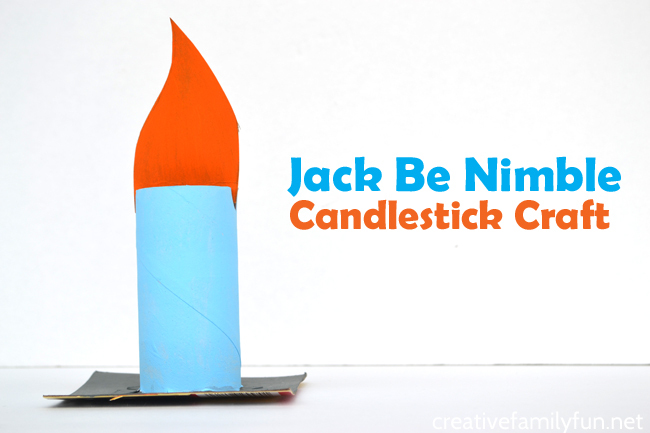 So, we’re gathering some of our favorite nursery rhymes for a few fun craft projects starting with this adorable Jack Be Nimble Candlestick Craft. 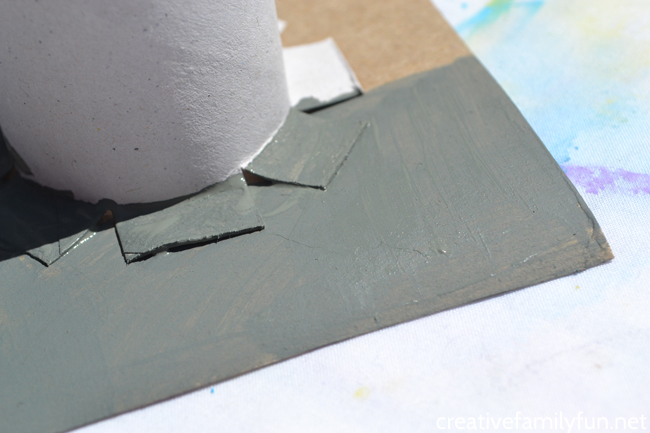 First, cut a square from your thin cardboard that is approximately 4 inches by 4 inches for your candle base. Flip the cardboard over so that the glossy printed side is on the bottom. Next, we need to attach our candlestick to our base. On one end of your cardboard tube, cut 1/2 inch long slits all the way around. Make them about 1/2 inch apart. Fold all your notches down so that your tube resembles the picture above. 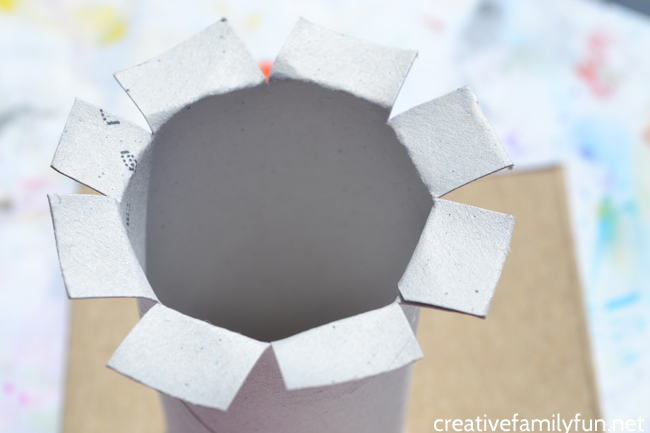 Finally, glue your cardboard tube to the center of your candlestick base. Press down and let the glue dry. While the glue is drying, pick out your candlestick paint colors. You can paint it all one color, or as many colors as you like. This is a great time to get creative! Paint your entire candlestick and base once your glue has dried. While your paint is drying, you can make your flame. 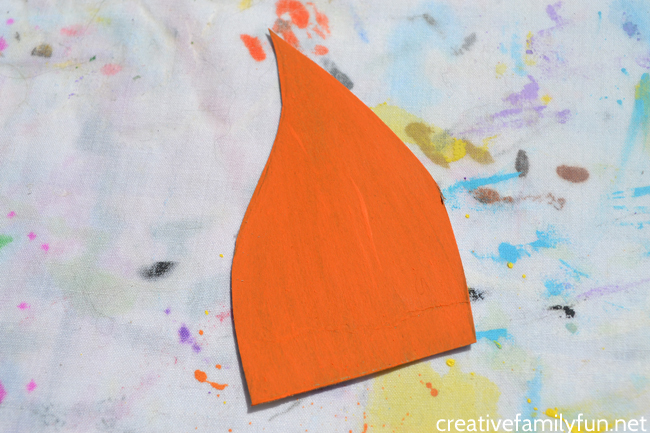 Draw a simple flame shape on another piece of your thin cardboard. Make sure the base of your flame is wider than your candlestick. Cut out and paint your flame so that it looks like fire. After your candlestick and flame is dry, cut two slits in the top of your candlestick directly across from each other. Insert your flame into the too of the candlestick. 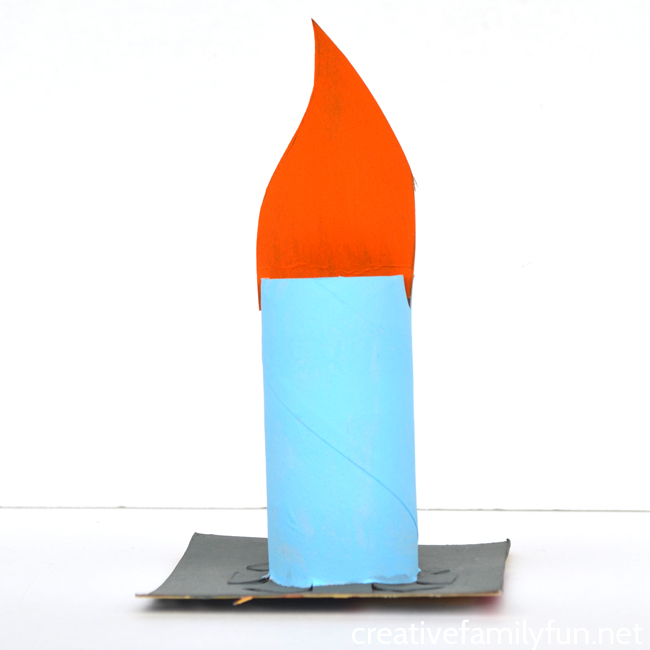 Use your cardboard candlestick as a fun prop to act out Jack Be Nimble. Can you jump over your candlestick? 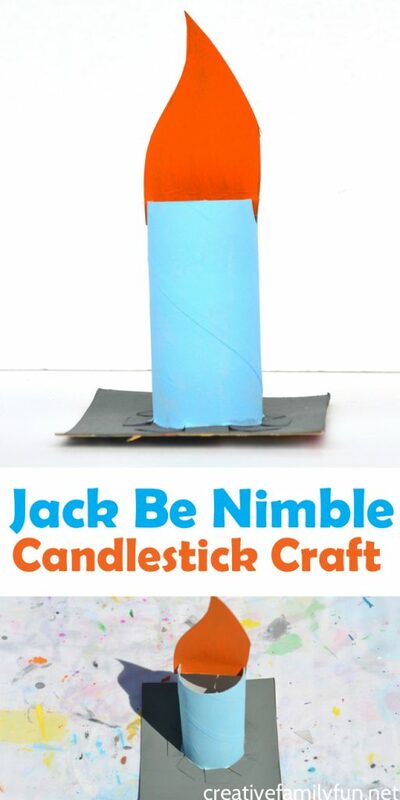 If you enjoyed this Jack Be Nimble Candlestick Craft, the above photo is perfect for sharing on Facebook or you can save the photo below on Pinterest.